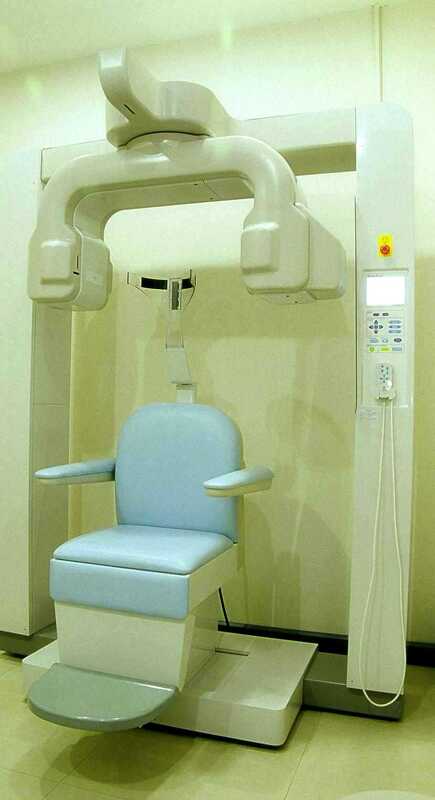 A dental digital X-ray (radiography) system can take a picture of your teeth, then almost immediately shows it to you on a computer monitor while you are in the dental chair. You no longer have to sit there for fifteen minutes and wait for an X-ray film to develop…and develop. The on-screen picture will look like a dental X-ray image but a lot bigger! Your dentist can zoom in on a single tooth, rotate it, sharpen it and colorize it – all to aid in your diagnosis. Want to take home that stunning tooth image? Your dentist can print out a color copy for you. We place a small, flat sensor in your mouth. The sensor is connected to a computer by a thin wire. Next, an X-ray beam is sent through your teeth and into the sensor, which records the image of your teeth and sends it to the computer. The sensor can then be repositioned to photograph other sections of your teeth. Your dental checkups take less time. Because the dental digital X-ray system is more sensitive than dental X-ray film systems, your exposure to X-rays is cut as much as 70 percent. The large and color-enhanced images let you see what your dentist sees, so it’s easier for you to understand how your dentist will treat your teeth. Your fees don’t include payment for photographic chemicals, film, processing or film storage. Used photo chemicals and film are not dumped into the environment. Finally, it’s a blast to watch this system work! Most patients are amazed. Digital x-rays are an extremely progressive addition to our dental office. Digital x-rays are computer generated images. These images require up to 70% less radiation than with conventional film type x-rays. Instead of using the traditional silver-oxide x-ray film that must be developed and then fixed in caustic and environmentally damaging solutions, the new system takes pictures via a small electronic sensor and it then instantaneously transmits a picture of the tooth onto the video monitor in the treatment room. Therefore, we can see your teeth and surrounding structures immediately. Not only does the new digital x-ray eliminate the usual wait for x-ray film to be processed, but it also is highly sensitive, so that patients are exposed to even less radiation than with conventional x-rays. X-ray projections appear on computer monitors within a few seconds in full view so that both patients and our professional team can simultaneously view the results. The computer allows enlargement, highlighting, magnifying, inverting, clear viewing, and contrasting of x-ray photos. This new technology adds further benefits for our patients. We can detect cavities far better than with the old system, and sooner and smaller than ever before. That means that we can correct them sooner and easier for you, before they weaken tooth seriously. An example of digital x-ray is shown here in small size. You can envision what this would look like in a full screen dimension.